Watercress (Nasturtium Officinale) is a native plant of Europe and Asia. It was not popular here in the states in the distant past. 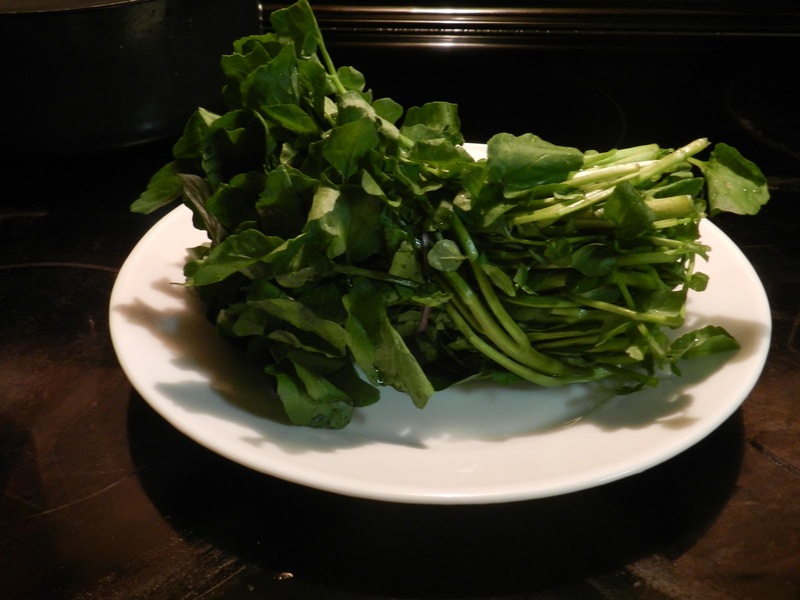 But how I love watercress when I was younger growing up in Hong Kong. And I still love it. 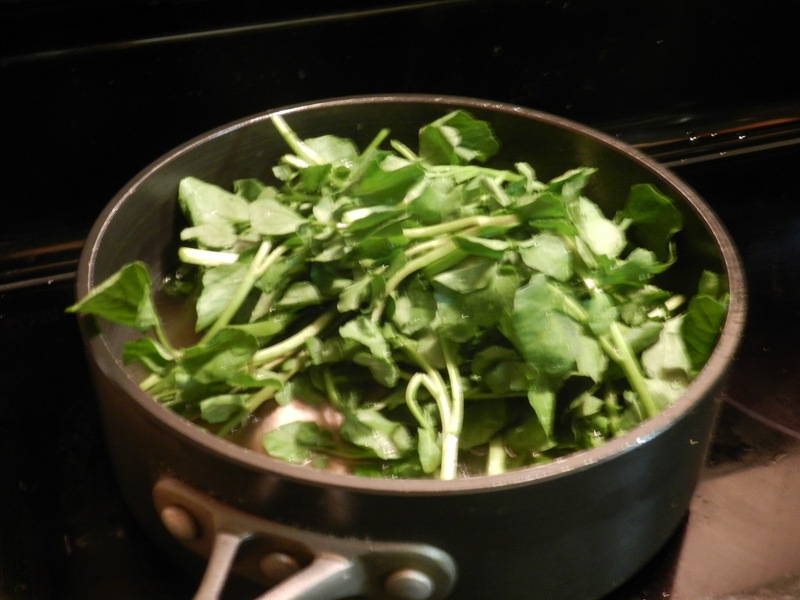 Watercress is one of my favorite vegetables. Thank you, mom, for introducing me to these great veggies when I was wee old. Recently, I noticed that our local supermarket actually carries watercress. I was pleasantly surprise because normally I can only find it in the Asian markets. However, the price was somewhat higher than what I am used to. So, I am going try my hand in growing them. 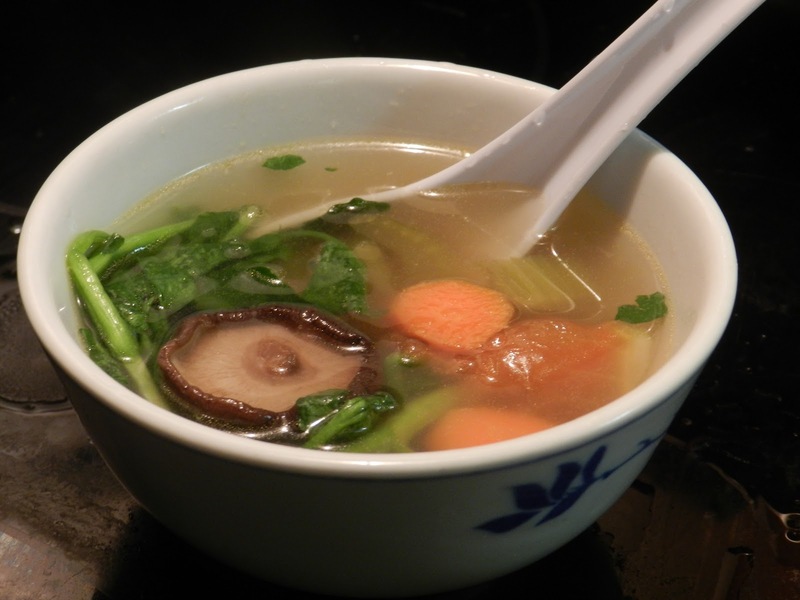 As an inspiration, I cooked some watercress soup for tonight. Here are some pictures of it. This veggie is pack with vitamins & minerals (Vitamin A, Vitamin C, Vitamin E, Vitamin K, Thiamin, Riboflavin, Vitamin B6, Calcium, Magnesium, Phosphorus, Potassium, Manganese)It is also a good source of Protein, Folate, Pantothenic Acid and Copper. There are two methods of growing. You can start from seed or propagating it from the original plants. I will pick the latter. Take the grocery bought watercress and stick it in a soil medium and keep it moist. Watercress normally grows in fast moving water, like shallow streams. Sounds simple but I do the same with scallions and they grow well. I LOVE watercress but thought that it necessarily required moving water. When you propagate it from grocery bought, you say “keep it moist in a soil medium.” How moist? And what kind of light, I presume shade? And can you please post the recipe for the yummy looking soup? Watercress is an aquatic plant but it is not a necessity to plant in moving water. It needs moist, rich soil. Do not let soil dry out between watering. Over watering this plant will not hurt it since it grows well in water. This is an easy to grow plant. Hope this helps & have fun!